You wait for something to happen on the underground dining scene in Ireland for years – and then they all come along at once. Two weeks ago I wrote about Clonakilty by Candlelight, last week my feature on that plus Lilly Higgins’s Loaves and Fishes Supper Club was broadcast on Lyric fm. Then, on Friday myself and the Writer took ourselves for a post-gallery launch, pre-bookclub dinner at Crackbird, the pop-up restaurant on Crane Lane in Dublin’s Temple Bar. It’s a lurve child of Jo’Burger, the chilled-out burger joint in Rathmines, and run along similar lines. There’s a simple menu, long shared tables and, especially in these early days, an air of almost giddy excitement about the place. While we balked at a whole skillet-fried buttermilk chicken (it can only be ordered in the whole or half for €17.95 or €9.95) and didn’t have time for a dozen wings (€11.95), the semolina chicken crunch and chilli chicken crunches (both €4.95) went down a treat. Crunchy strips of moist chicken breast, these came with dipping sauces of our choosing: I coudn’t resist the vietmint chilli while the Writer took the burnt lemon and whipped feta. Well flavoured salad sides – carrot cranberry and roast parsnip & nigella seed – and a shared cranberry cooler finished our selection. Our eager server was terribly enthusiastic about our choices, helpful with finding out where the chicken was sourced from (Irish, thankfully, from Cootehill in Cavan) and even brought us a sampler of the Percy’s honey with thyme and Llywelllen spritz to try out (very stylish medicinal-type packaging but the cider flavour was a little faint). From the repurposed jam jar that our cranberry cooler came in to the buckets of chicken arriving on other tables, the cutely patterened fabric napkins and the bare lightbulbs over the tables, we loved it. We were further charmed when our bill – €20.90 between two – came in a teeny tiny brown envelope, embossed with the Crackbird logo. The small details were just perfect. And the big detail: the food? 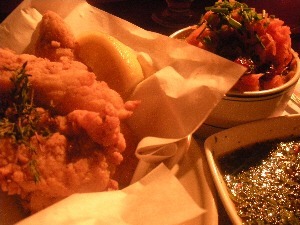 It was very tasty, just like Kentucky Fried Chicken gone very upmarket, but without the chips. Yep, it’s an almost carb-free zone. Perfect for anyone interested in doing the Atkins thing. Not a place that you’ll eat in every night but, then again, with a three-month lease on the place, Crackbird isn’t going to be hanging around forever. 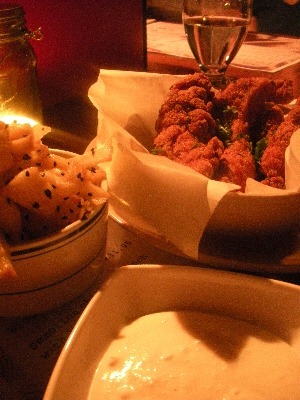 Check it out while it’s there: @CrackBIRDdublin on Twitter and don’t forget, you can tweet to eat for free food. Love how you went to a cool pop-up restaurant “post-gallery launch and pre-bookclub dinner”! I’m hoping to make it down there myself. It was a very busy evening! Is the chicken free range? If it is, I’ll definitely eat there! Afraid not Claire – and I did ask! – but it is Irish. Does anyone know if theres any underground dining in cork yet or any pop-up restaurants? I haven’t heard of any, Dee. I’d be very interested in hearing about any that are out there! I know that Lilly Higgins, who runs the Loaves and Fishes Supper Club, is based in Cork but her venue is in Dublin.